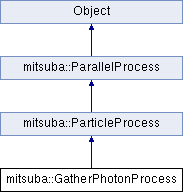 Process for parallel photon map construction. Given a number and type (surface/caustic/volume) of photons, this class distributes the work over an arbitrary number of machines. Return the number of discarded photons. Due to asynchronous processing, some excess photons will generally be produced. This function returns the number of excess photons that had to be discarded. If this is too high, the granularity should be decreased. Lists the nuber of particles that had to be shot in order to fill the photon map. Is this process strictly local? If a process is marked as local, it shouldn't be distributed to remote processing nodes. The default implementation returns false. Checks if the configuration of needed, generated and shot photons indicates an unsuccessful progress of the gathering. This check is taken from PBRT.